**Pro Kabaddi League Season 5** : "Dabang Delhi" beat "Bengaluru Bulls"
Dabang Delhi produced a terrific second half comeback to beat Bengaluru Bulls in the Inter Zone Challenge Week of Pro Kabaddi League. Meraj Sheykh scored 14 points for Dabang Delhi to lead his team to victory. Rohit Kumar scored 12 points for Bengaluru Bulls. Dabang Delhi were quick off the blocks as Meraj Sheykh scored a raid point to give them 3-1 lead after three minutes. Abolfazl made another successful raid as Dabang Delhi led 5-1 after five minutes. *Bengaluru Bulls* struggled to score points initially as Sunil Jaipal scored their second point in the seventh minute. Dabang Delhi began the second half strongly and scored three points in two minutes as they trailed 15-18. Ajay Kumar scored with a two-point raid in the 23rd minute as *Bengaluru Bulls* led 20-15. Meraj Sheykh made a successful raid as Dabang Delhi inflicted an all out in the 27th minute to level the match at 23-23. 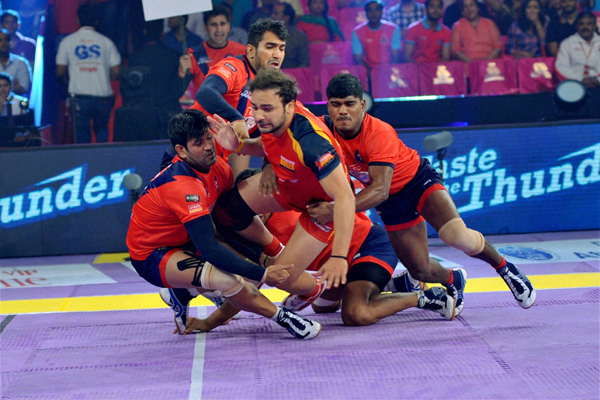 "Dabang Delhi" were relentless in the last 10 minutes as they inflicted another all out in 34th minute to lead 33-25. Rohit Kumar had a quiet second half for Bengaluru Bulls and the defence couldn’t handle Meraj Sheykh. Meraj Sheykh revived Dabang Delhi in the second half with crucial raids as they won 38-30.